Career and Technical Education endeavors to accommodate all student learning styles through the development and integration of academic content and hands-on technical skills based curriculum. This contextual and relevant blend helps provide the necessary motivation for student participation and learning that will lead to high demand, high wage career opportunities. Please click here to access your school district folder and other useful information. The CTE Department also facilitates the Southern Oregon Career and Technical Education Consortium (SOCTEC), a consortium of representatives from each public school district in Jackson, Josephine, and Klamath Counties; Rogue and Klamath Community Colleges; Southern Oregon University; Oregon Institute of Technology; the Rogue Valley Workforce Development Council; the Job Council; and the Bureau of Labor and Industries Apprenticeship and Training Division. 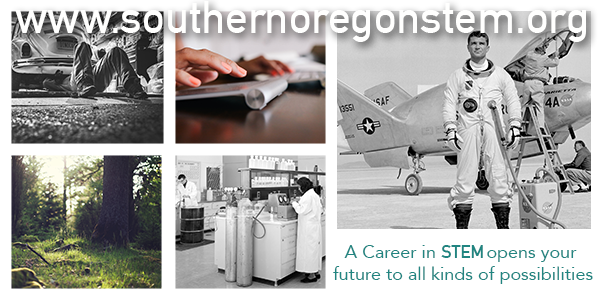 Southern Oregon STEM is focused on creating quality STEM partnerships within the Southern Oregon region and providing students with STEM experiences that will benefit both the students and the industries within our region.